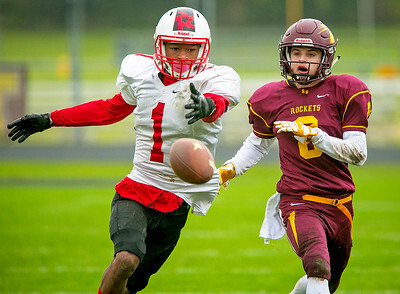 Daryl Quitalig - For Shaw Media Richmond-Burton defensive back Devin Bailey (25) intercepts a pass intended for Chicago Raby receiver Monte Tillman (6) in the second quarter of an IHSA Playoff Class 4A second round football game at Richmond-Burton High School Saturday, Nov. 11, 2017. The Rockets lost, 36-18, and finish the 2017 season with a 7-4 record. 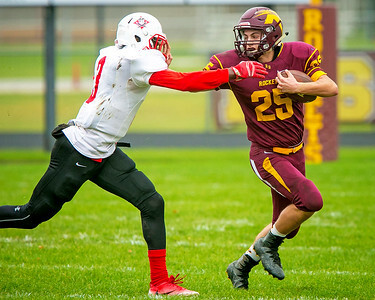 Daryl Quitalig - For Shaw Media Richmond-Burton running back Devin Bailey (25) stiff arms Chicago Raby's Sirshaun Gardner (3) on a run in the first quarter of an IHSA Playoff Class 4A second round football game at Richmond-Burton High School Saturday, Nov. 11, 2017. The Rockets lost, 36-18, and finish the 2017 season with a 7-4 record. 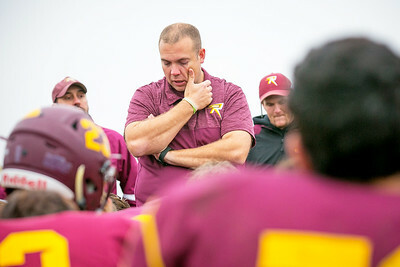 Daryl Quitalig - For Shaw Media Richmond-Burton head coach Tad DePorter wipes his cheek during a postgame speech after losing an IHSA Playoff Class 4A second round football game to Chicago Raby, 36-18, at Richmond-Burton High School Saturday, Nov. 11, 2017. The Rockets finish the 2017 season with a 7-4 record. 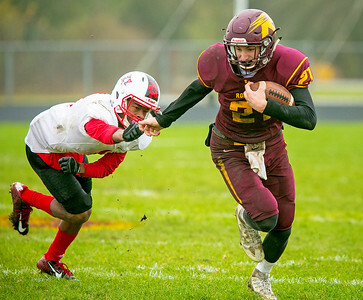 Daryl Quitalig - For Shaw Media Richmond-Burton quarterback Shane Byrne (21) evades Chicago Raby defensive back Dontay Givens (1) on a scramble in the second quarter of an IHSA Playoff Class 4A second round football game at Richmond-Burton High School Saturday, Nov. 11, 2017. The Rockets lost, 36-18, and finish the 2017 season with a 7-4 record. 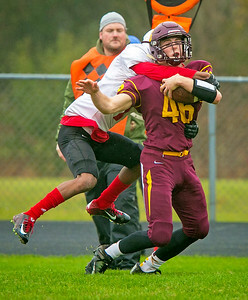 Daryl Quitalig - For Shaw Media Richmond-Burton running back Michael Kaufman (46) fights for extra yards en route to a touchdown in the first quarter of an IHSA Playoff Class 4A second round football game at Richmond-Burton High School Saturday, Nov. 11, 2017. The Rockets lost, 36-18, and finish the 2017 season with a 7-4 record. 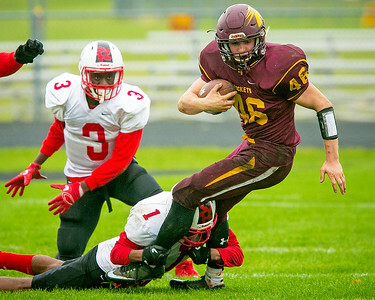 Daryl Quitalig - For Shaw Media Richmond-Burton running back Michael Kaufman (46) fights for extra yards on a run in the second quarter of an IHSA Playoff Class 4A second round football game at Richmond-Burton High School Saturday, Nov. 11, 2017. The Rockets lost, 36-18, and finish the 2017 season with a 7-4 record. 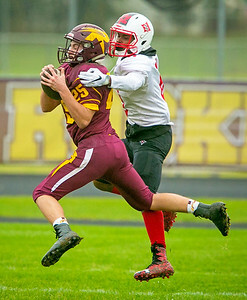 Daryl Quitalig - For Shaw Media A pass intended for Richmond-Burton running back Matthew Kortan (8) is overthrown in the second quarter of an IHSA Playoff Class 4A second round football game at Richmond-Burton High School Saturday, Nov. 11, 2017. The Rockets lost, 36-18, and finish the 2017 season with a 7-4 record. 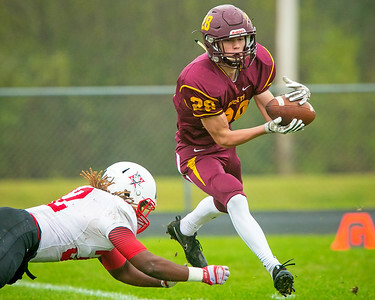 Daryl Quitalig - For Shaw Media Richmond-Burton's Payton Minzey (28) makes a catch in the first quarter of an IHSA Playoff Class 4A second round football game at Richmond-Burton High School Saturday, Nov. 11, 2017. The Rockets lost, 36-18, and finish the 2017 season with a 7-4 record. 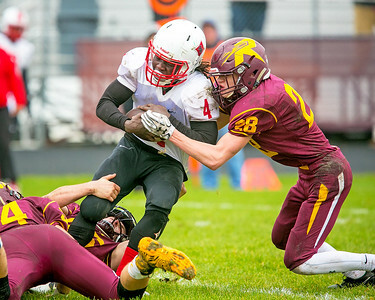 Daryl Quitalig - For Shaw Media Richmond-Burton defensive back Payton Minzey (28) stops Chicago Raby running back Danquis Smith (4) in the second quarter of an IHSA Playoff Class 4A second round football game at Richmond-Burton High School Saturday, Nov. 11, 2017. The Rockets lost, 36-18, and finish the 2017 season with a 7-4 record. Daryl Quitalig - For Shaw Media Richmond-Burton Andrew Myland (70) takes a moment after losing an IHSA Playoff Class 4A second round football game to Chicago Raby, 36-18, at Richmond-Burton High School Saturday, Nov. 11, 2017. The Rockets finish the 2017 season with a 7-4 record. 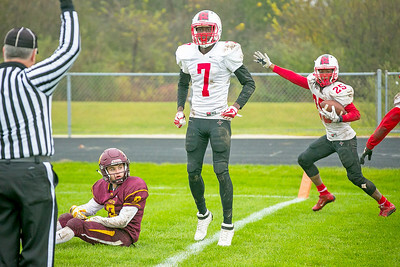 Daryl Quitalig - For Shaw Media Chicago Raby's Romel Goston (25) and Marshawn Foster (7) and Richmond-Burton's Benjamin Orkild (3) react after a pass intended for him is confirmed an interception in the fourth quarter of an IHSA Playoff Class 4A second round football game at Richmond-Burton High School Saturday, Nov. 11, 2017. The Rockets lost, 36-18, and finish the 2017 season with a 7-4 record. 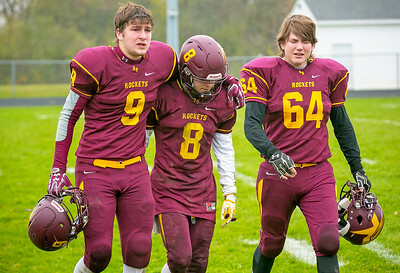 Daryl Quitalig - For Shaw Media Richmond-Burton's Luke Uhwat (9), Matthew Kortan (8), and Sean Cook (64) walk off the field together after losing an IHSA Playoff Class 4A second round football game to Chicago Raby, 26-18, at Richmond-Burton High School Saturday, Nov. 11, 2017. The Rockets finish the 2017 season with a 7-4 record. 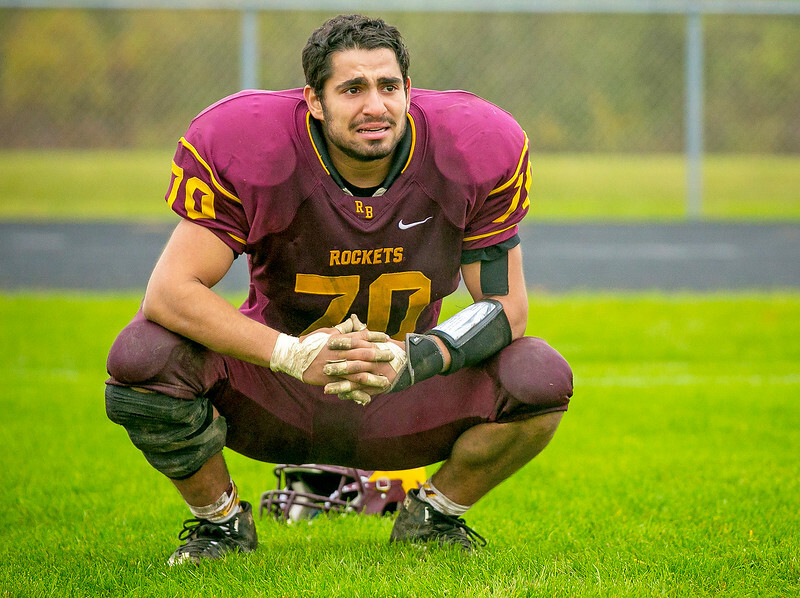 Richmond-Burton Andrew Myland (70) takes a moment after losing an IHSA Playoff Class 4A second round football game to Chicago Raby, 36-18, at Richmond-Burton High School Saturday, Nov. 11, 2017. The Rockets finish the 2017 season with a 7-4 record.